Note that the ship designer can now be accessed from the main menu. Nothing really new here, I just think it's cool. Here's one of those ironies. 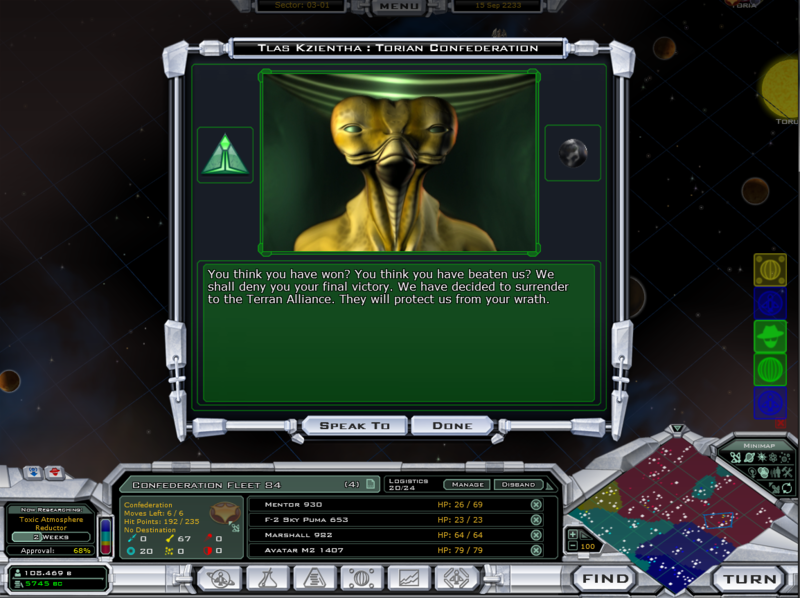 The feature of being able to randomly pick races and randomize intelligence came out in a post-release update which, I think you guys would agree vastly increases the replayability of the game. This is precisely why games should always have a post-release budget. On Demigod, incidentally, Stardock has a budget for post-release updates as part of the project development cycle. So it's not just some thing we do, it's a big deal to us. 2.0 continues to improve on the graphics of the game such as the new star port graphic. 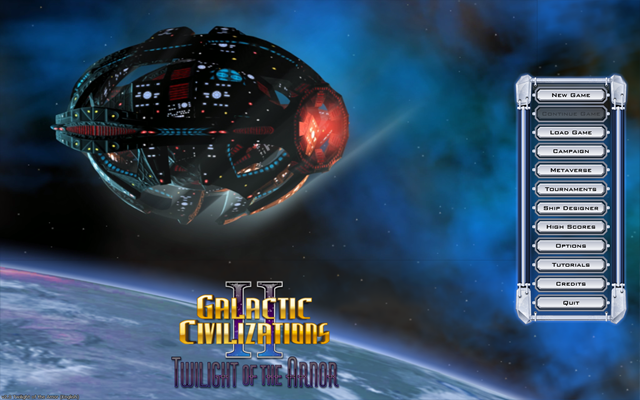 If you look back at the original release of Galactic Civilizations II from 2006 and how it looks in v2.0, it's a night and day difference. Even without updating the engine, this shows how important it is to not abandon a game after release or shortly after release because you can really help a game become timeless by just updating the graphics. 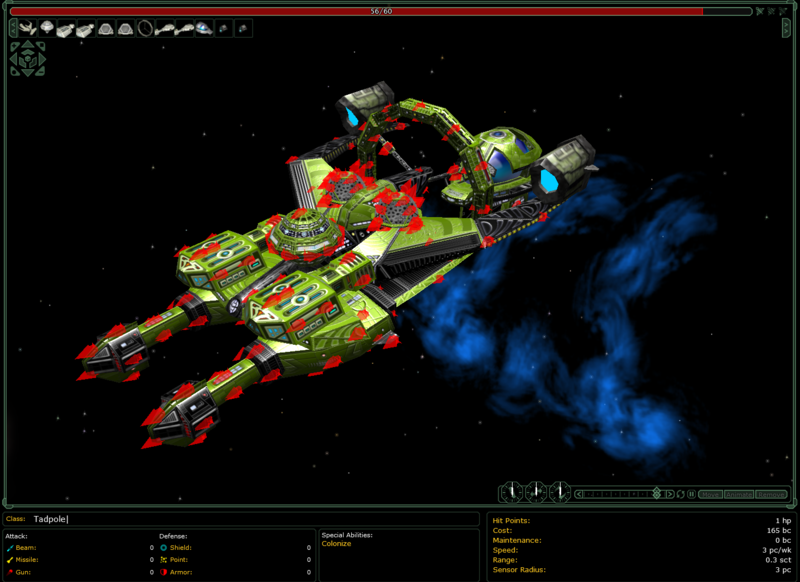 These graphics should remain pretty good for quite a long time (at least until 64-bit gaming becomes common). Asteroid fields, introduced in Dark Avatar, how did we ever imagine GalCiv without them? This is what wide screen was invented for. 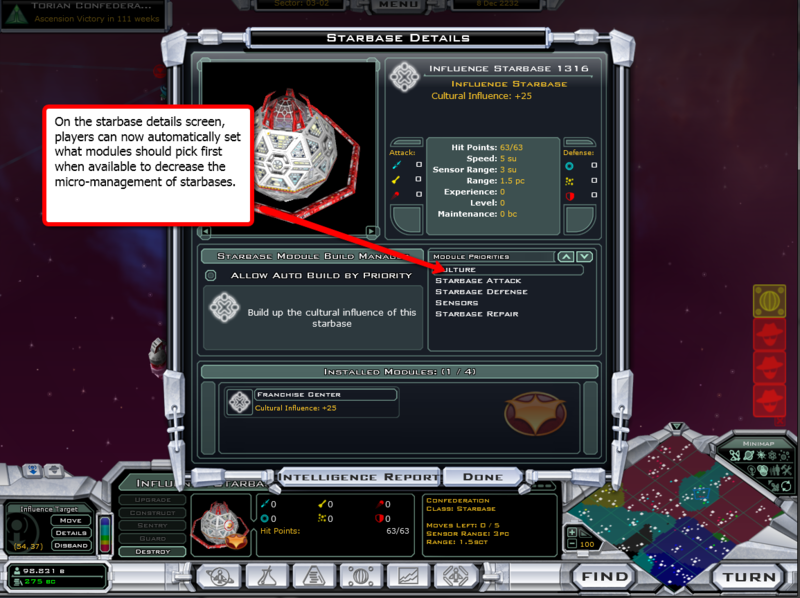 Super Abilities were introduced in Dark Avatar which gave us Spore ships. Whohaha! 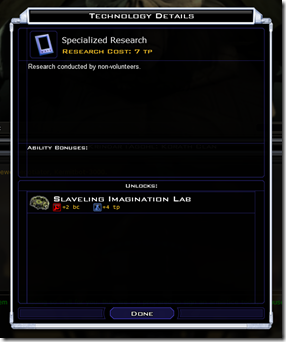 New in 2.0: more explicit listing of costs. Seems obvious in hindsight. 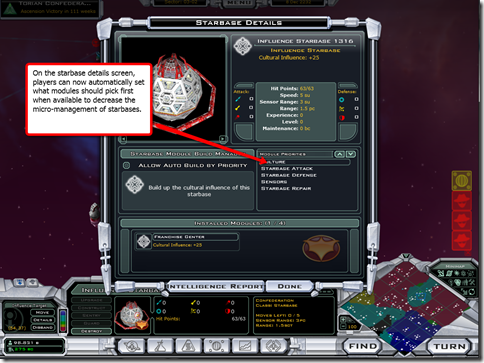 2.0 expands the espionage features based on player requests. 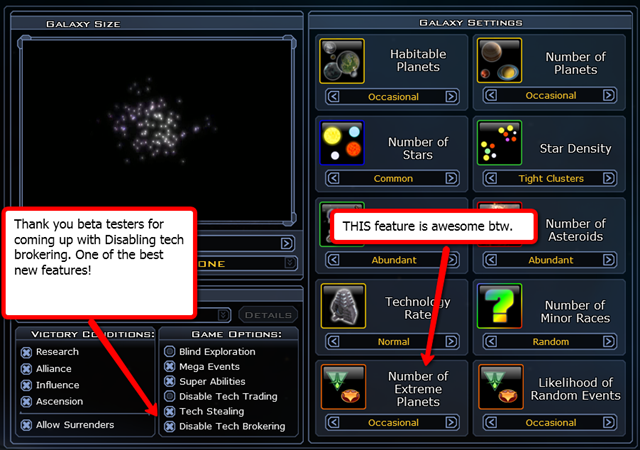 Dark Avatar users also get this feature as part of 2.0 (though we hope they all upgrade to Twilight of the Arnor!). This is something that was introduced in Twilight of the Arnor. 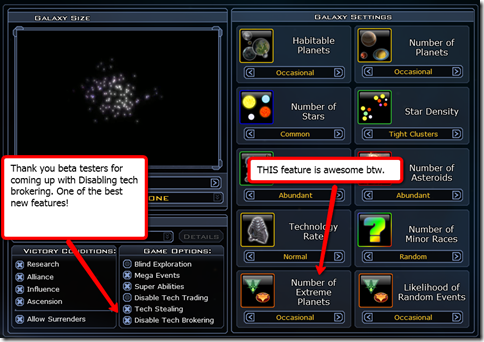 Instant detailed access to what a given tech gives. THIS is why we have open beta programs. 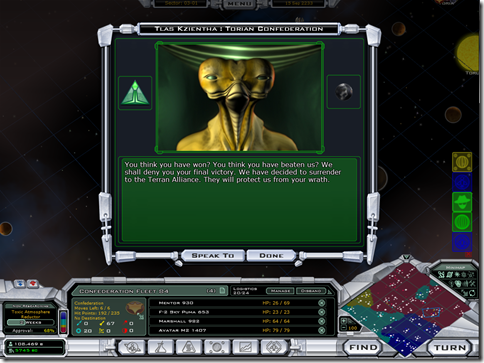 Kudos to GalCiv players for not just thinking of this but designing this. 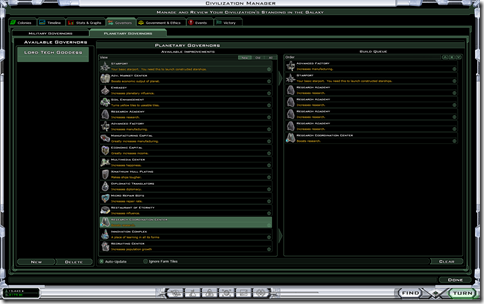 Thanks to I-Mod productions, a group formed of GalCiv players, the battle effects of the game got better and better. 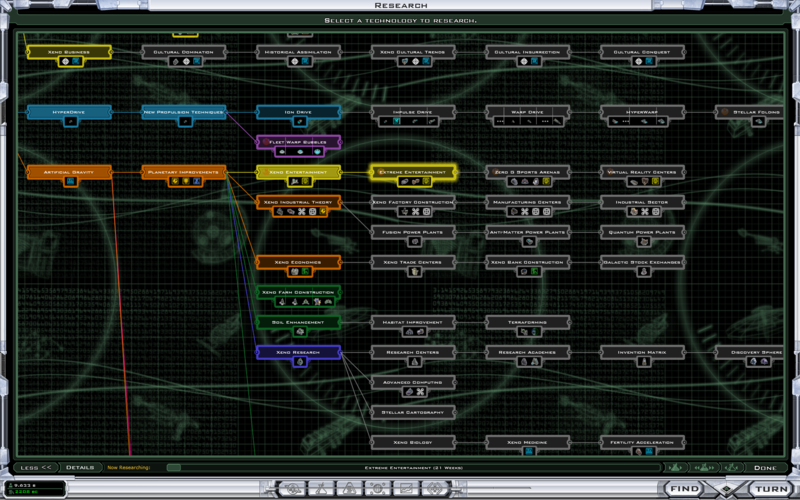 People might wonder what the difference is between an "indie" developer and a non-indie developer. 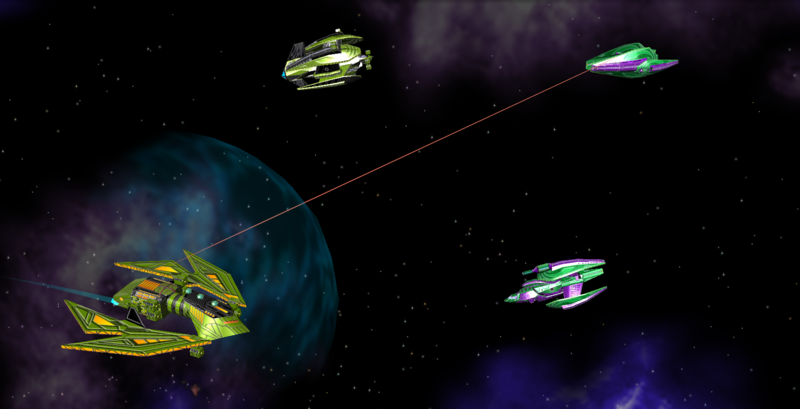 Here's one difference: The indie developer has the flexibility to integrate the best and coolest stuff into the game regardless of where it came from. 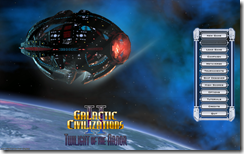 New in Galactic Civilizations II v2.0 is the Governor creator. 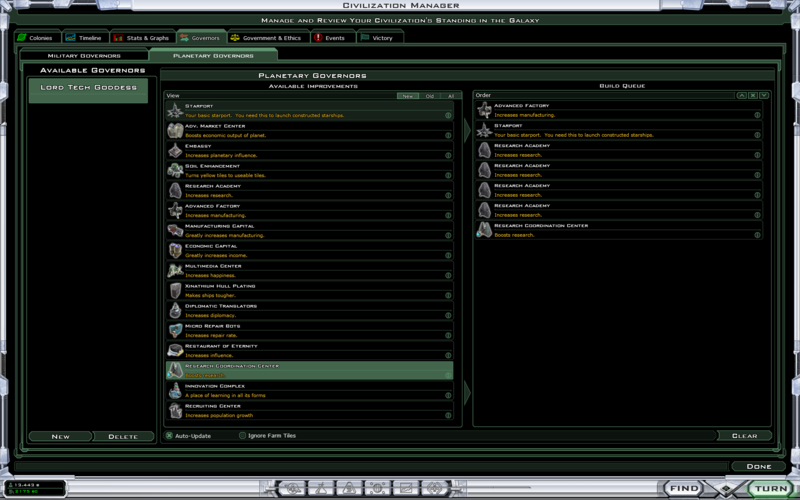 Players can now create their own governors who will automatically place particular planetary improvements. 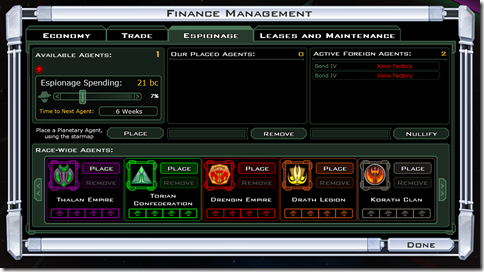 Then on the details screen on the planet screen you can assign whatever governor you want. 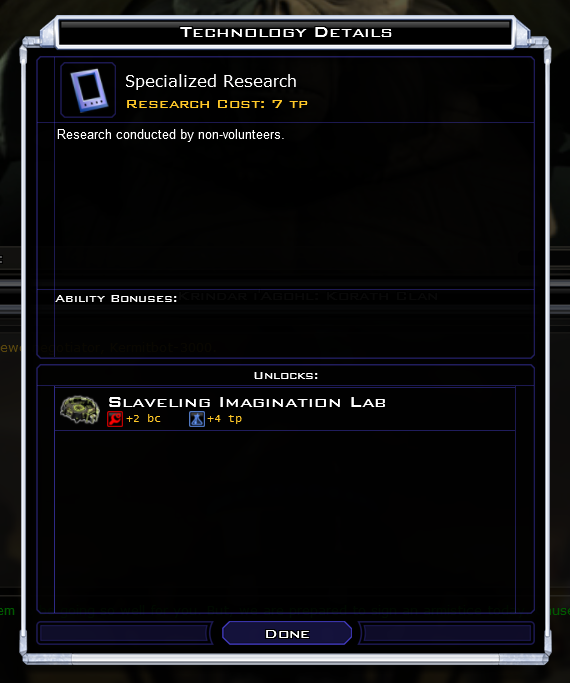 This feature alone makes 2.0 pretty killer. 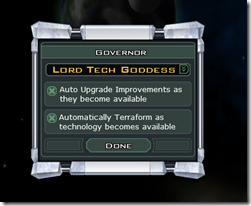 The governors in 2.0 have gotten a lot of attention to make late game automation a snap. 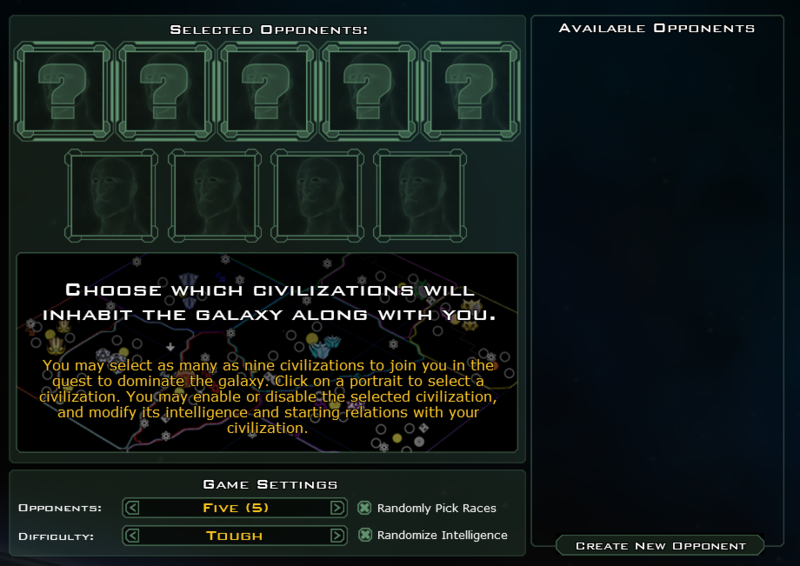 The AI is just as much of a sore loser now as always. But a bit smarter now. Cna you create millitary governer? 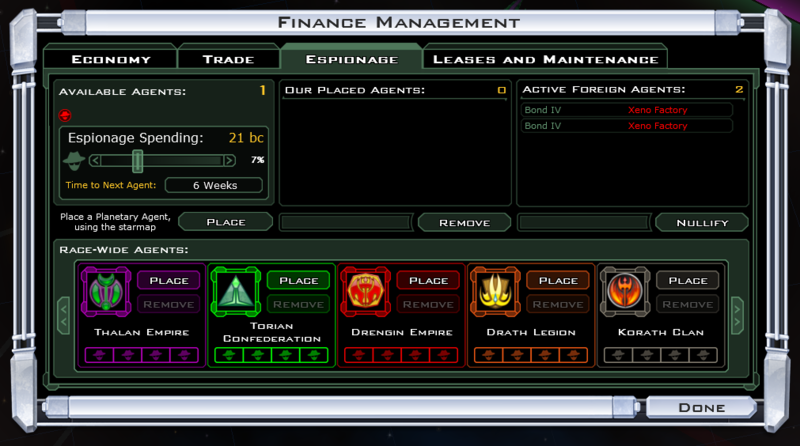 Well that's what i was assuming about the millitary governer thing. This is a very nice primer indeed. 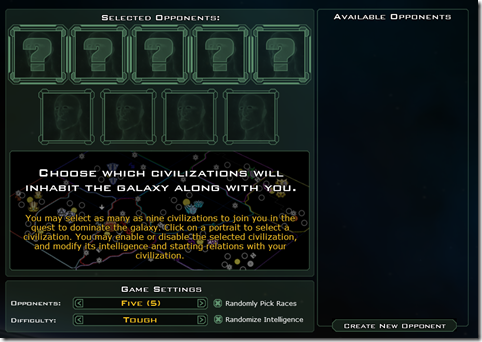 would be sweet to be playing this now as opposed to watching the election returns. Is 2.0 still scheduled for release tomorrow? Yep. I'm playing the RC. Great work! This will get me to buy Twilight of the Arnor. I guess now I'll have to leave work and go home to try the new features . PS: Isn't it available for download yet ? I went home from work just to see if the update was available for download .... that tells a lot about my social life doesn't it ? 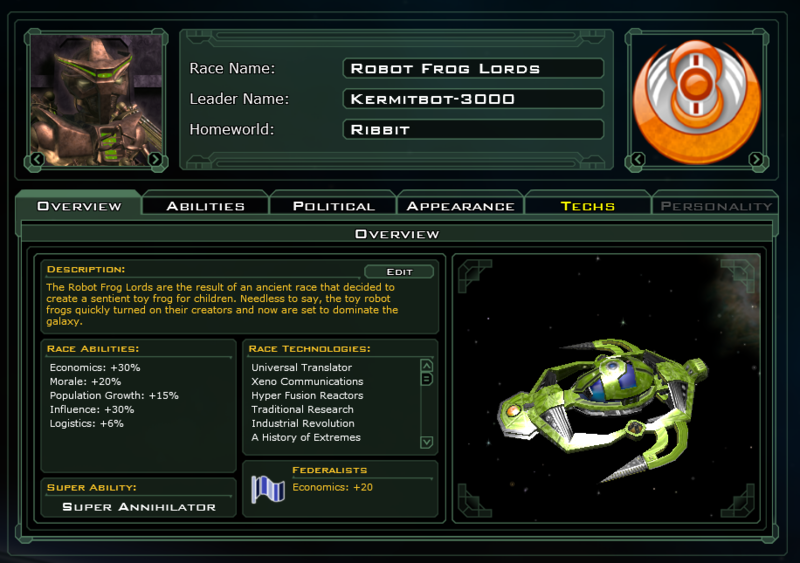 Frogboy can we now save the planetary governors we set up as this was not available in the beta and meant we had to set them up every game..
Do the autoupgrade and autoterraform options stick with a governor, are they per-planet, or are they still global? Update still not available on Stardock Central, despite the announcement of its release. Waiting patiently. 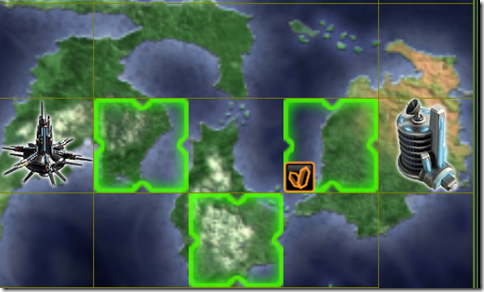 I got a question, on Impulse where would find it? Is it under My Games or is it under Updates? Also I checked and there was an update for DL and DA, both said that they were versions 2.0. So I was wondering if i had to download the update for DA? I got a question, on Impulse where would find it? Is it under My Games or is it under Updates? Both. Just choose whichever tab suits you. 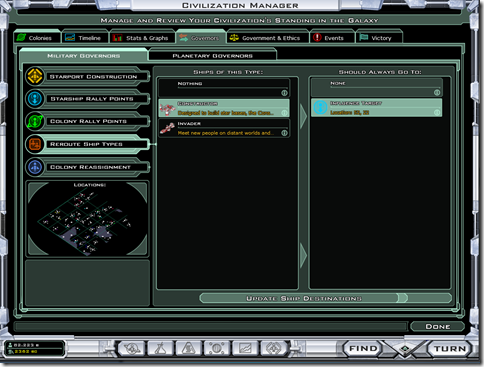 That's a problem, as Impulse requires .NET, which cannot be installed into a Crossover Games bottle. 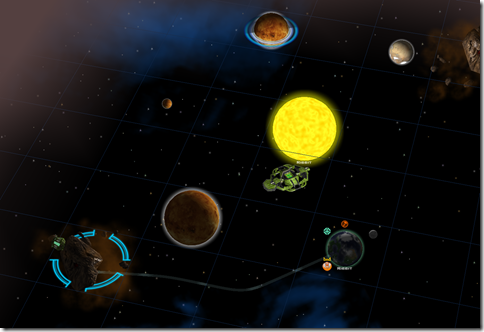 Stardock will have to make the update available some other way as well. This might get me back into GC2. I havne't played in a long time since I've been full on working on my Civ 4 latter but I just might take a break for a while. 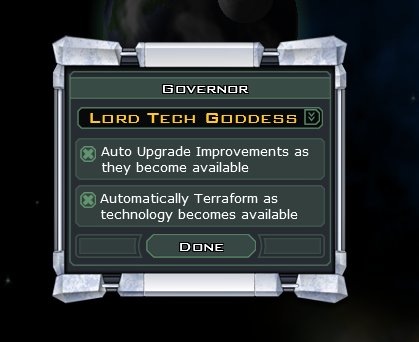 Cool deal on the governors. Didn't GC1 have them? It was a feature I always missed. 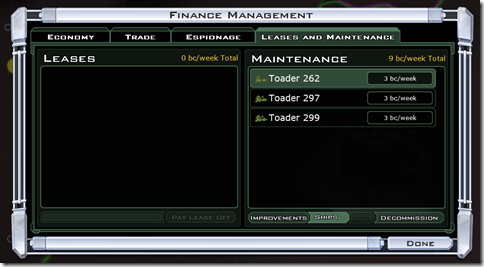 That's strange - a few minutes ago my Impulse client patched GC2: Dreadlords to version 1.53.136. 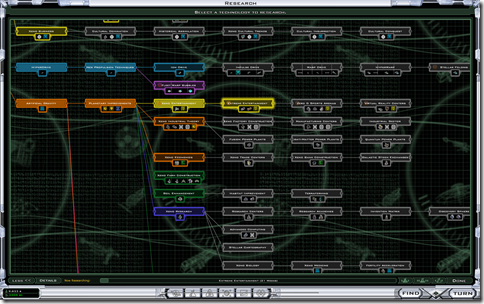 Unless I missed an announcement, the plan had been to put the final bits for 2.0 up on SDC as well. 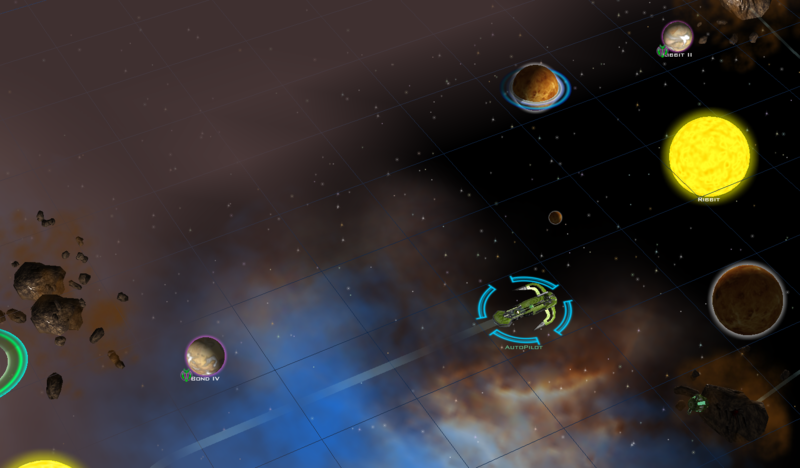 We were almost going to be able to get the beta that way, but some snafu happened that made it not worth the effort. Perhaps an evil offspring of that problem is delaying the process. 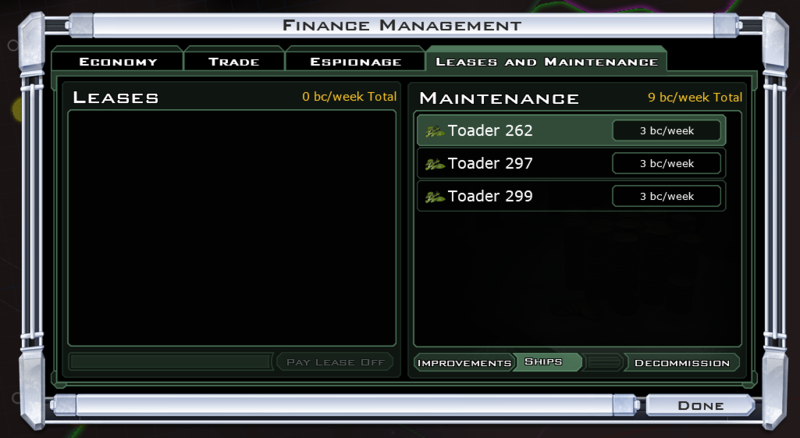 It appears that I can't update TA to 2.0 because i don't have a serial keyfor TA because I ordered the CD version. I need help!! !